Krabi, on south Thailand’s western coast, is a great spot for us outdoorsy gays, lesbians (or however you choose to identify). Perhaps it’s after clubbing it up in Bangkok that you’re looking to get away, or you’re not the party type and looking to head out to nature, its unique combination of azure waters, stunning beaches, dense mangroves and sheer, impressive limestone cliffs makes it a diverse and at times challenging ecosystem for your adventures. 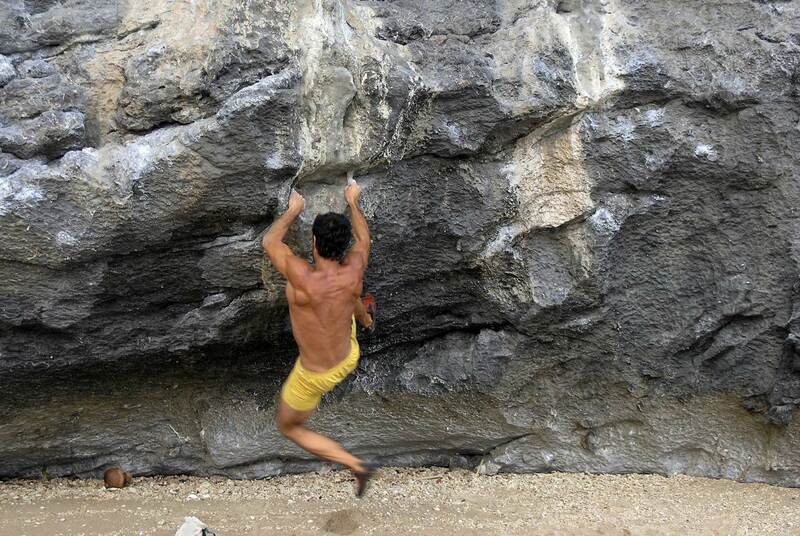 Rock climbing – Krabi offers excellent climbing opportunities for climbers of all abilities. For the most experienced, the limestone cliffs provide challenging overhangs and stalactites unlike those you’ll find elsewhere. And for beginners, there are pocketed walls which you can explore with an experienced guide. And you know what they say about climbers’ bodies… So you’re guaranteed ample eye candy apart from the stunning scenery and views of the Andaman sea. Sea Kayaking – There’s plenty to see along the coast of Krabi and kayaking is a great way to take it all in. You can choose to hire a local guide to lead you to all the best spots, or go it alone for a romantic outing on a two-person kayak with a special someone. The dense mangroves are home to a plethora of wildlife including friendly and sometimes cheeky monkeys. You can also take a picnic and beach hop, or be adventurous and tour the ‘hongs’ – mazes of spectacular caverns in the limestone cliffs. Krabi Tree Top Adventure Park – thrill seekers will enjoy a trip to this spot deep in the jungle of Ao Luk. The park is constructed around high level suspension bridges, giving you amazing panoramas and a sneak peak into the habitats of local birds and wildlife. To add an extra dose of excitement, the platforms are connected by ziplines so you can soar through the foliage, tarzan-style, and even try riding a bicycle eight metres in the air. Scuba diving – Krabi is home to great diversity in terms of dive sites – which is great news as it caters for everyone from first-timers attaining their PADI qualification, to expert divers. For example, Koh Dam is a set of two tiny islands, connected by a spit of land at low tide. It’s located near to Railay and Ao Nang so easily accessible for a short trip, and is shallow so good for beginners. Those with a daredevil streak will thrive at Hin Daeng and Hin Muang, where the life aquatic can be seen, including whale sharks and manta rays. Jungle Trekking – For those who like things a little more ‘wild’ than ‘mild’ try going off the beaten track and trekking through the sensory experience that is the jungle of Krabi. 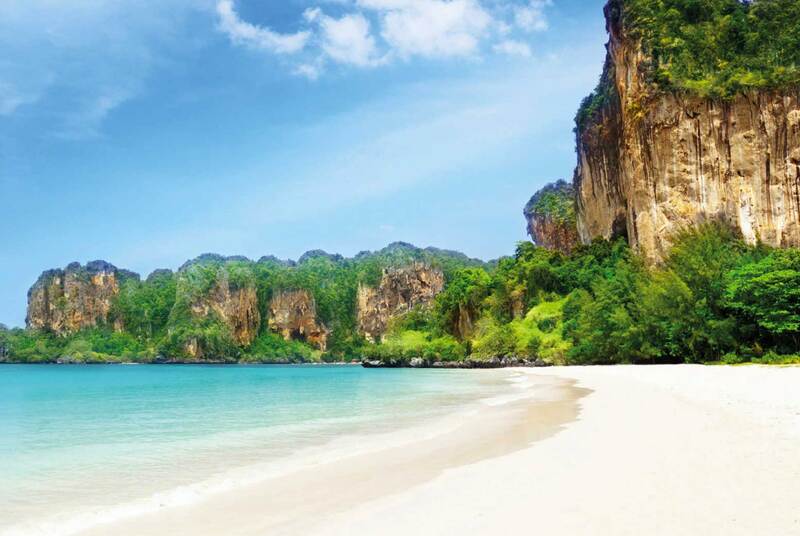 Railay features many lesser-known spots for taking a walk and immersing yourself in the sights, sounds and smells of nature. You can expect to see hidden lagoons, jungle clearings and labyrinthine caves. You’ll also be getting a glimpse of the habitats of the local fauna – including exotic birds, gibbons and even some creepy crawlies. If creepy crawly things isn’t up your alley, you can always check out the Princess cave in Railay – it represents the womb and as thus is filled with countless wooden approximations of male fertility, left as offering by couples trying to conceive.